Love animals? Love wine? This Cayman Islands fundraiser is right up your alley! Grand Cayman's beautiful Grand Old House, located on South Church Street in Grand Cayman. Thursday, May 14th from 6 to 8pm. 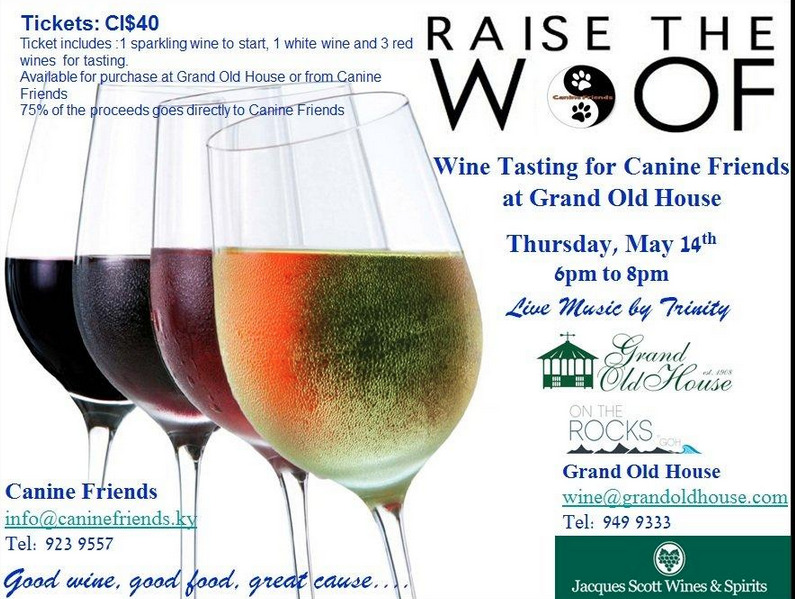 Grand Old House is hosting a Raise the Woof wine tasting fundraiser for Canine Friends, a local animal rescue and welfare organization in the islands. A great way to support dogs and cats in need, the night includes tickets to taste 1 sparkling, 1 white and 3 red wines as well as delicious food and live music from Trinity. Sure to be a spectacular night, there will also be a raffle for a stay at The Meridian on Seven Mile Beach. Wine will be supplied by Jacques Scott Wine and Spirits. Tickets are $40 and must be purchased in advance from Grand Old House, Canine Friends or Island Veterinary Services. 75% of all of the proceeds generated will go to support Canine Friends' tireless work in Cayman. A great event for an even better cause, Raise the Woof is sure to please. Are you an animal lover? Show us your pets on Facebook or Twitter! Tuesday, 12th May 2015, 08:19pm.